Just a simple design can make all the difference and also enhance the image or the flowers that you also wish to add to the card. 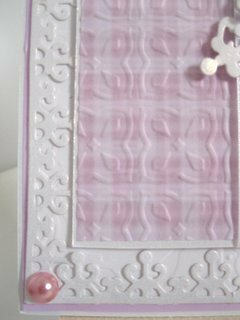 Maybe you have embossing boards that you can use to add that extra touch or perhaps it can be something really easy like using a Card Ribbler on the card. I am often asked what is the difference between a Mask and an Embossing Folder. But both techniques are useful for adding patterns and texture to your cards for beautiful effects. 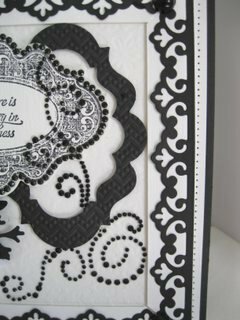 Embossing Folders are thicker and need to be opened so that the card you wish to add the pattern too can be placed inside. And as each machine is different I cannot list them all here. 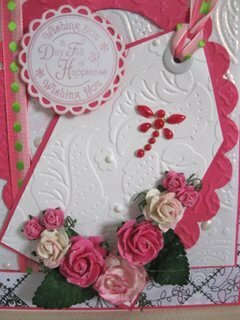 The Tag to this card has been in an embossing folder and the result enhances the flowers that have been added to it. The featured card in the video is a large 8" square and the beautiful image is from the Sugar Plum Daisy CD from Polkadoodles and not the Candy Doodles one mentioned in the video. The panels on this card have just had the papers textured and even that small change can make the look better. If you find that your paper splits in the folder then you could try adding it between sheets of copier paper to prevent that. So I hope you enjoy the video and will take a look at some of the others too. There are some really lovely embossing folders that will suit any theme that you are making for male of female cards. And there are even 3-D folders that will help you in adding texture on different levels for a really deep look.